CLICK HERE to enter the gallery . . . and then click on each pic to keep going! about Bible verses that have become deeply meaningful to them for one reason or another. I started thinking that it would be a wonderful idea for folk to have those verses from God's Word specially designed and hanging on their wall, sitting on their desk at home, or like mine...tucked inside their Bible. And that's how this all started! to you on life's journey? a reminder of how God's Word touched your life in a special way. 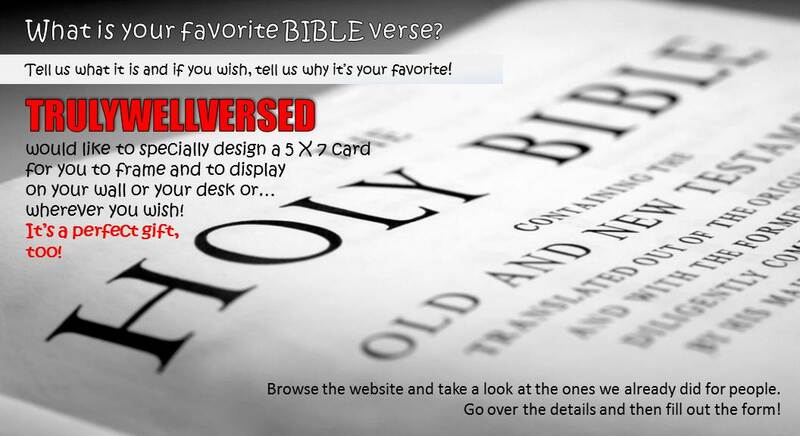 The cost for a TRULYWELLVERSED Bible verse card is only $2.00 plus around $.65 for the 5x7 photo sent to you from a photo site such as Mailpix!